No group of football supporters in the world can beat Liverpool for sheer pomposity. There's a link to more of this sort of thing here. Or do you prefer this? 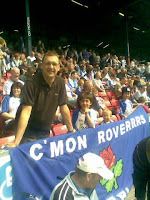 I don't think our much more basic "C'MON ROVERRRS" banner will echo in eternity, but I like it. Also for your amusement is a link here to You Tube featuring David Bentley and David Dunn in a dance off in a Preston night club following the players awards do last week.